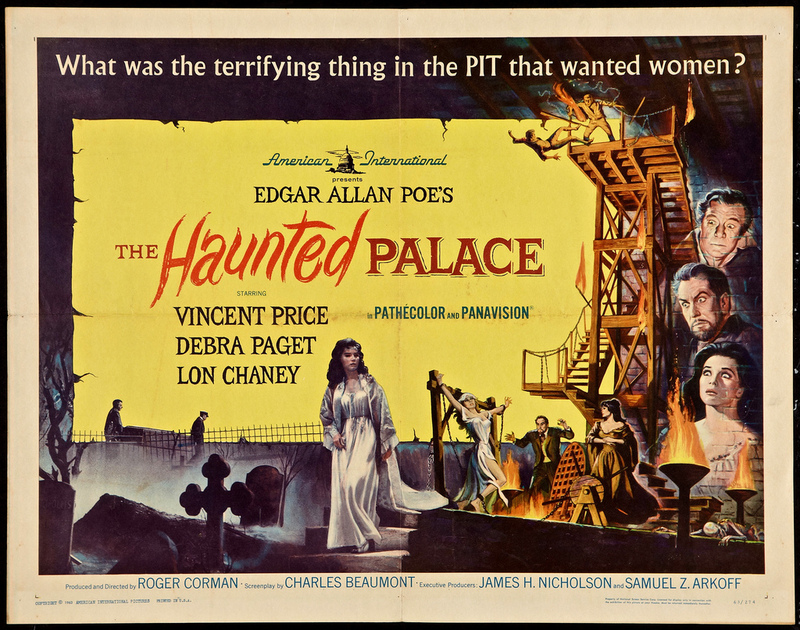 Roger Corman and AIP once again treat us to a Vincent Price graveyard fest that while being hailed as another of the Edgar Allan Poe entries is in truth an adaptation of H.P. Lovecraft’s The Strange Case of Charles Dexter Ward. But who really cares, in the end we get another colorful entry in the Corman/Price cycle that is thoroughly entertaining and brings along a first rate cast of players to join in the fun. This from Leo Gordon to Elisha Cook Jr. as they watch a young woman enter a castle belonging to a bearded Vincent Price. Picking up a cue from Bava’s essential Black Sunday, the villagers of this New England town gather together and drag Price’s warlock to the nearest tree and burn him alive for bewitching the young women of the area. Before the flames take hold, Price will curse these men and their families for centuries to come. Among them are Gordon, Cook, John Dierkes and Frank Maxwell. Moving along 110 years later we’ll find the same actors portraying the great great grandsons of those we met in the opening prologue. 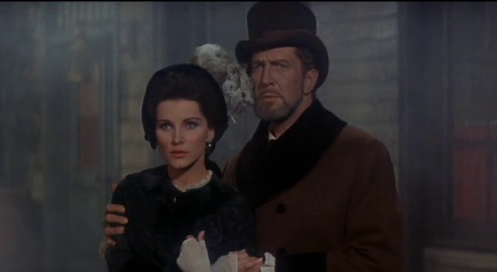 Price has arrived in the village with the beautiful Debra Paget in tow as his wife. He’s come to claim his inheritance. That of the castle that no one wants to discuss with him in the local inn where he’ll find all the men who attended the burning of his ancestor. Leo is stern and warns Price to leave the village while Dierkes lends a calmer tone suggesting Price and Paget give up the castle. Cook is his old self and shifty looking while the kindly town doctor, Maxwell, guides the married couple to the long abandoned castle. Abandoned? Not quite. 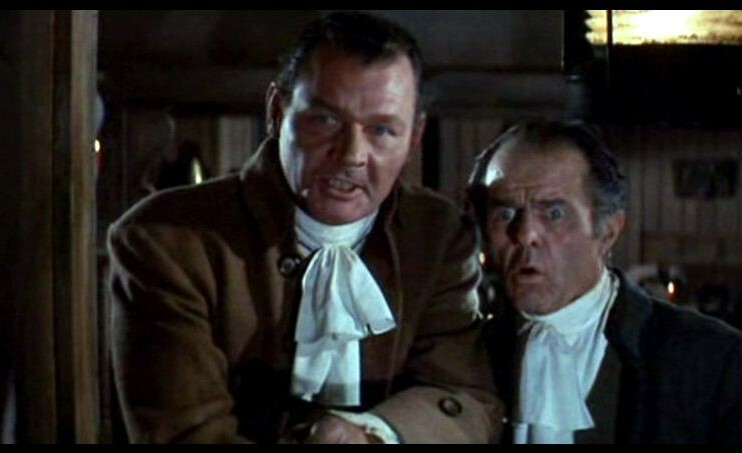 Lon Chaney Jr. turns up within the castle halls looking as if he’s just been embalmed. He passes himself off as the caretaker who has been awaiting their arrival. Price is a gentle man with lovely Paget as a caring wife. That is soon to change when Price sees the painting of his warlock ancestor. There’s a voice over narration from the evil Price’s spirit. He’s been awaiting his doppelganger and is about to enter his new host body giving the calm and gentle Price an arrogant, evil countenance . Just the way we like him. The good doctor Maxwell will resurface to give Miss Paget someone to confide her worries in. Worries that are turning into reality when Maxwell shares the story of Price’s ancestor and his dabbling in evil spirits and the Necronomicon. A book of great power and evil. Within Price rages an inner battle between good and evil, he’s losing the war to the evil spirit of his ancestor and Paget is paying for it. Turns out Lon is a disciple from the past and like any gothic tale from Corman, we’re off to the graveyard to dig up Price’s mistress from the past. Portrayed by Cathie Merchant, I can’t blame him. Miss Merchant looks as if she’s graduated from the academy of Russ Meyer Studios. I’ll leave the rest of this enjoyable entry in the Price/Corman/Poe cycle of filmmaking to you. Even if it is a Lovecraft tale. Honestly I wish we could have just stopped the clock when Price was making these films. They’re just so well put together. He’s perfectly cast in these tales and the color photography that Corman captures only compliment the eras in which these macabre tales are presented. I’ve seen them all a number of times and wish that somehow there was an undiscovered lost entry in the series. If I told the average film buff they were going to be watching a film with Leo, Cook and Dierkes filling out the cast, they’d probably be making the assumption we’re about to see a western. While western heavy Leo Gordon may seem an odd choice to star in this Corman thriller, you might not know that he also dabbled in screenwriting. He’s credited on Corman’s The Wasp Woman from 1959 and would also write Corman’s ’62 effort The Tower of London. He would go on to write the popular 1967 WW2 film Tobruk. 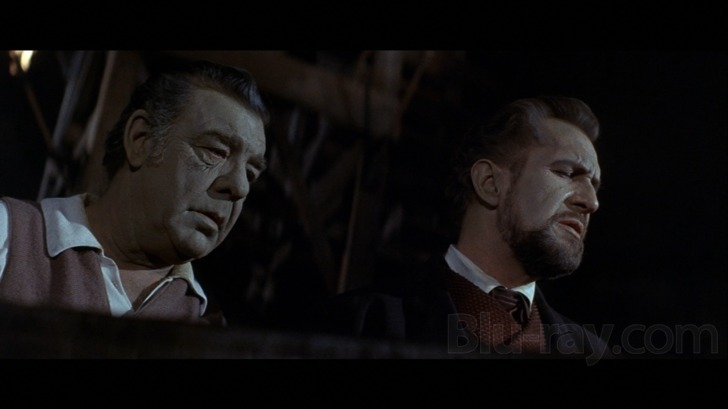 As for the aging Lon Chaney Jr., it’s unfortunate that this was his only appearance in the Price/Poe films. 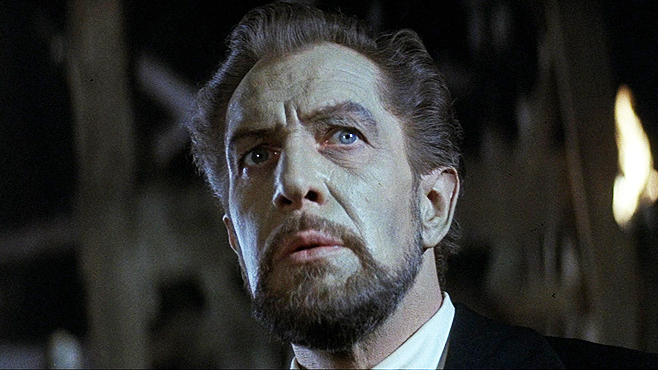 He’d have been a welcome addition to the other titles that had Price appearing opposite old pros Rathbone, Karloff and Lorre. Surely Corman could have shoehorned Lon into those fun filled terrors as well. Debra Paget played her final movie role here. She had also appeared with Price in Tale of Terrors for Corman and even going back to 1956 she starred alongside Price in The Ten Commandments, the same year she played opposite Elvis in his film debut, Love Me Tender. 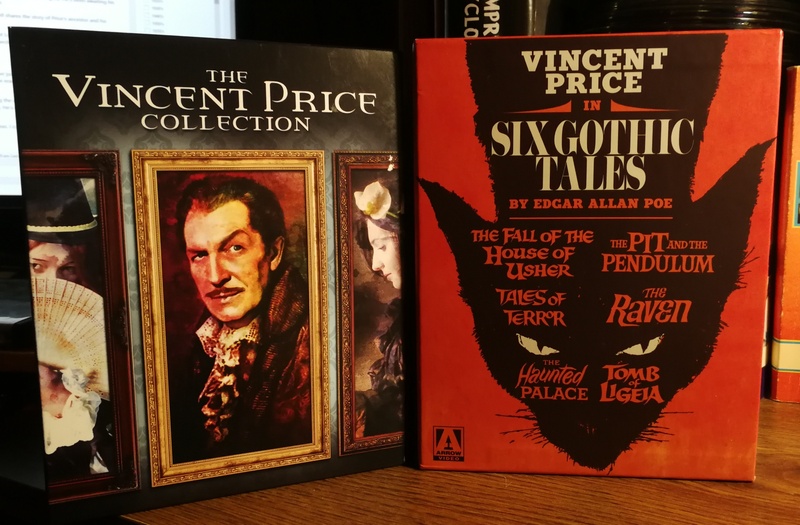 Available on DVD, Palace has also turned up in the Vincent Price collection from Scream Factory on blu ray as well as a Price box set from Arrow Video overseas. I couldn’t make my mind up so figured I’d get both collections. In some ways this film always did seem like a lost entry in the series to me. It is, I think, one of the lesser-known Corman/Price films and one I came to after having seen all the others. It’s great fun, as expected, and I absolutely love the look, the whole visual aesthetic of these movies. It’s well lit with the appropriate Roger touch but yeah it kind of sits aside of the others and maybe it’s the whole Lovecraft thing. Maybe Milland should have starred in this one and Price in The Premature Burial. Interesting idea. Mind you, Milland was fine in that role if you ask me.